Shifting from live music to spoken word to dance to theater, Genre Bender showcased Seattle artists of every order, each highly lauded in their own right. A party-like atmosphere bookended the show, which was produced by City Arts and held at the Cornish Playhouse February 15 and 16, and made it clear that the event is focused on building and celebrating the arts community from the artists on out. The opening act, a long set of electronic music, featured composers Lusine (Jeff McIlwain) on the mixing board and Trent Moorman on drum kit. The music deftly fluctuated between driving grooves, softly gurgling vocals, ambient hums and patters. Well-balanced sound blending highlighted the layers of the music and set the volume high without bursting eardrums. Presenting this style of music in a traditional theater setting was the most genre-bending aspect of the piece. It was both strange and wonderful to see (and hear) this sound in the limelight, but it could have been equally appreciated in a club where listeners would have the option to dance. Still, it gave the performers an opportunity to garner a more sensitive appreciation for their work. 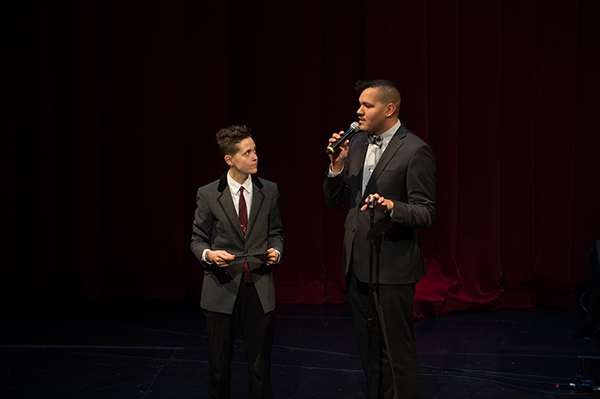 The second piece, A Hug in the Dark, by Ahamefule Oluo and ilvs strauss, used spoken word, music, and dance to explore the tenderness in revealing personal histories to strangers. Outfitted in velvety grey suits with black lapels and stylish swoops in their short hair, the duo presented an exploration of letters so personal they could only be sent to strangers, and the replies only strangers could give. With little flourish, each artist stood at the mic to read his or her letter, followed immediately by a response from the other. The letters wound through intimate passions of love and injury, graphic desires, painful hatred, and yearnings that would be too impossible to ask for sincerely. In their replies, the performers took on the roles of the intended recipients, perhaps including more imaginative, even surreal detail than would possible for someone deeply involved. Movement by strauss and instrumentation by Oluo augmented the emotional impact of the piece. 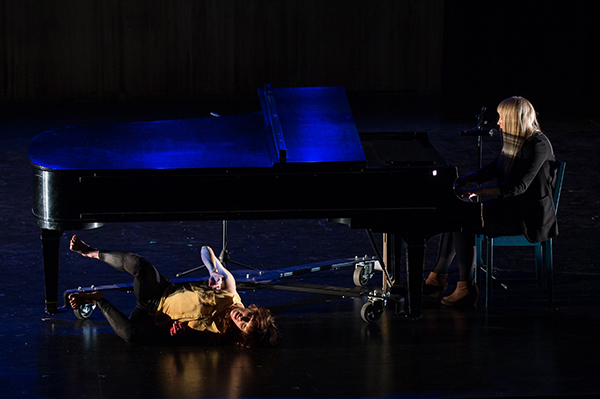 Next came The Thing Worth Fighting For, a collaboration between singer/songwriter Kaylee Cole and dancer/choreographer Jessica Jobaris plus a large cast of performers. Cole began the piece with a strained rendition of “Confidence” from The Sound of Music. Her bold, melancholy voice intoned the song as a mantra for the cast of characters, most of whom clearly lacked self-confidence. Like Cole, each performer took on a definite persona with issues to overcome, fighting their own battles to be comfortable in their own skin. The piece had many captivating moments: Neil Coffey sorted through a drawer of silverware and mementos, throwing away the most poignant; a solo from Jobaris both captured the playful abandon of children and used risk-taking dance technique. Ultimately, though, the choreography felt disjointed, and it could have benefited from honing in on more in-depth explorations of specific images rather than brushing past the most moving narratives in order to squeeze more in. Actress Marya Sea Kaminski and designer Mark Mitchell came together brilliantly in Snapdragons on Ice, or God, Is There No Exit from the Carnage of Virginia Woolf’s Private Life?. In the most rollicking success of the night, Kaminski and Mitchell played a delightfully dystopian couple putting on a happy face for their party guests and ever-present camera crew. With make-up and hair crews at the ready, the couple struggled to maintain their perfect image, turning insults into jokes and fondly twinkling their fingers at each other with plastered smiles. Even as their spectacle inevitably devolved into increasingly violent outbursts of pent-up anger and resentment, they recovered themselves with banter dripping with self-aware sarcasm: “Come, let’s be superficial,” Kaminiski quipped after a monologue revealing her discontent. Marvelously, they highlighted exactly what makes such a life seem both sinister and glamorously amusing. The evening concluded with Artifice of Color by Shaun Scott and Ezra Dickinson, a video presentation supported by dance and poetry. 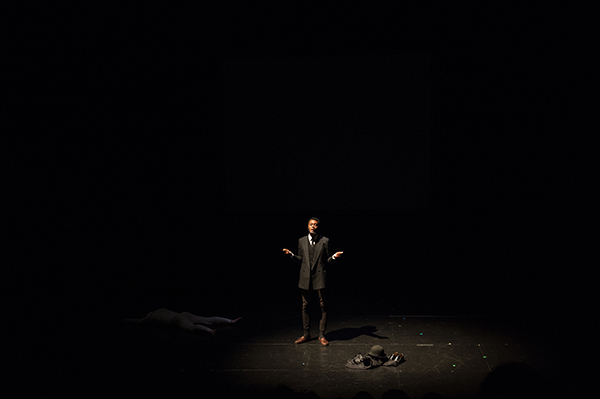 The piece began as Dickinson took the stage, his movement echoing the twisted convulsions of a black man under a Taser gun in the brown-tinted police footage that appeared behind him. An overwhelming history of black culture in America, the piece explored everything from minstrel shows to police brutality and the dustbowl to the “environmental exhaustion” and civil rights movements of the 1960s. Scott’s recitation of “The Mask” by Paul Lawrence Dunbar became the heart of the piece, resurfacing again and again. “We wear the mask that grins and lies…With torn and bleeding hearts we smile,” he declared, reminding us that the racial struggles of the past run deep under the surface. Indisputably, the pairings in this year’s Genre Bender produced interesting work that tackled heavy topics. The works clearly embraced the strengths and influences of each artist, but whether the pairings actually “bent genres” is debatable. Snapdragons came closest, leaving a strong impression by cleverly blending Kaminski’s theater chops with Mitchell’s strong sense of design. Likewise, the pairing between Moorman and Lusine produced high-quality art that sounded distinctly different from each artist’s individual work, but still stayed safely within the genre’s expectations. Perhaps Artifice of Color, which used dance very minimally to actually interact with the video, made the most surprising choices in merging its disciplines. The performance was enjoyable and thought-provoking, but it would be fantastic to see future collaborations push the boundaries even further to produce art that is not just high-caliber, but genuinely unexpected, something that is ever more difficult to achieve with Seattle’s seasoned audiences.